Transportation Costs > How Much Does a Pop Up Camper Cost? How Much Does a Pop Up Camper Cost? A pop-up camper, also referred to as a folding camper, is a towed recreational vehicle that can be collapsed for easy storage. When it’s set up, it can offer a large amount of interior space. In general, the price of a pop up camper can be anywhere from $3,000 to over $20,000 depending on the features, brand, capacity, and amenities. However, you can find older units used for as little as $500 to $1,500. Generally, the less you pay, the fewer amenities you will get or the older the camper will be. According to CampingEarth.com, new pop up campers can cost anywhere from $5,000 to about $20,000 for a large, fully furnished unit. At RVTrader.com, a dealer of new and used recreational vehicles, pop up campers can cost anywhere from $3,000 to $12,000. If you have your eyes on a certain make and model, the NADA Guides, similar to the Kelley Blue Book for cars, can offer a fair price you should be paying. Pop up campers can accommodate two to four people, depending on the size. Tent campers with bigger rooms are often larger in size and costlier in price. Folding campers have standard amenities such as a bathroom, bed(s), a stove, a heater, a refrigerator, and awning. The high-end ones are often equipped with more features including an air conditioner, cable TV hookup, extra shelving and storage, heated mattress pads, a stereo system with outdoor speakers, and a power lift system. Some of the more expensive tent camper models come with features that make setting up even easier than standard models. Units with A-frame models or the hybrid models are quick to and simple to open. Older tent campers are naturally less expensive compared to the newer models. The newer units often have better features, more amenities, or components that have been upgraded. Attaching the pop up camper to the tow vehicle requires installation fees, which usually depends on towing capacity, materials used and labor costs. The towing rating must first be determined in order to find out what the vehicle and the trailer can handle together. This is to ensure safety when towing the trailer down the road. The towing rating factor in the trailer size as well as its maximum loaded weight. When the total weight to be towed and the weight of the tow vehicle is established, the next thing to deal with is obtaining the right hitch, which comes in four types: receiver-style, weight distributing (load equalizer), fifth-wheel, and gooseneck. In most cases, you won’t need a certain kind of vehicle to lug it around. Insurance needs to be considered in the case of an accident. In most cases, this shouldn’t be any more than $20 per month with more insurance companies. Depending on the model and its manufacturer, a pop up camper basically comes with amenities and features for camping, with the capabilities of folding it down for easy towing and storage. Many models come with a camp stove and may include an eating area, a fridge, a furnace, a stove, beds and mattresses, a bathroom, extra space typical of travel trailers, or an awning to provide shelter right outside the camper. Also, pop up camper models have a range of floor plans, which gives buyers several options from which they can choose. Shop around and look at as many tent campers as possible to get an idea of what features you prefer to have in a pop up camper. This can help you avoid buying a replacement or upgrading the unit. Visit several dealers and look at as many pop up campers as possible. Find out about the features and take note of the prices offered. Check if the dealer offers an extended warranty policy on the pop up camper you wish to purchase. If you are only going to camp a few times a year, you should consider purchasing a used model. If you enjoy camping so much that you go very often, consider getting an upgraded model. 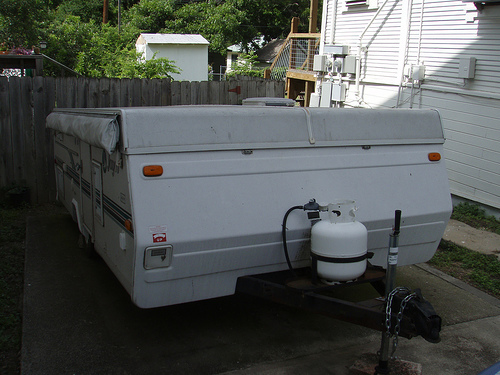 When buying a used unit, have a professional perform a thorough inspection to ensure the trailer is in good condition. What vehicle is needed to pull the pop up camper? Are electric brakes needed to pull the camper? Does it have a water heater? How many gallons of water does it hold? How many propane tanks does it have? Does it have an air conditioner? Is there an add-on room? Does it have an awning? Is the door sound and secure? Does it have a storage area? Does it have a support rack for bicycles, surfboards and other such gear? What maintenance procedures does it require? Find online or local dealers that are offering clearance and/or sales. Like cars, you may be able to get last years model for a lot less. Consider buying a used pop up camper. Many of these are well taken care of and sold by previous owners for less than $3,000. It will cost much less than a new one; however, it will generally not come with a warranty. To be sure, buy one from a dealer who offers warranties on used models. Also, you may need to perform a thorough inspection of the unit before making the decision to buy. If purchasing used, the Popup Princess created a very handy checklist. If you don’t feel as if you’re going to use it as much as possible, highly consider renting one. Renting one, from the research we had done, can be as little as $50 per day in some areas.